Flash is here to save us all! First-ever 3 3/4-inch scale action figures from the 1980 feature film Flash Gordon. Limited edition and individually numbered sets! Features unique diorama packaging and accessories. Entertainment Earth Convention Exclusive! Oh no Evil Emperor Ming is out to destroy Earth but, not to fear. Flash is here to save us all... in 3 3/4-inch scale that is! From Bif Bang Pow! 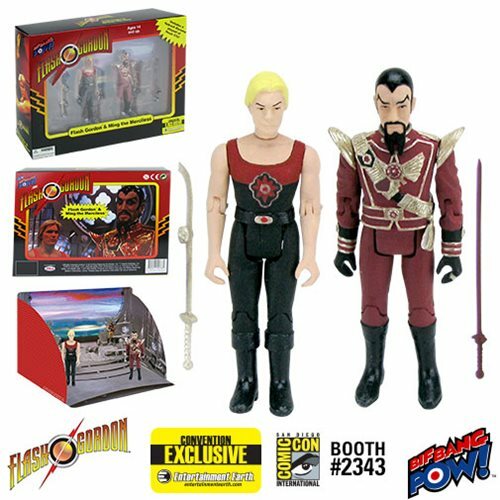 comes the Flash Gordon Hawk City Scene 3 3/4-Inch Figure Set – Convention Exclusive. Each limited edition set of 1,500 pieces comes individually numbered with a holographic sticker. Recreate the memorable Hawk City scene from the 1980 film Flash Gordon, with the Flash Gordon™ and Ming the Merciless™ 3 3/4-inch scale action figures. Each figure has 9 points of articulation and comes with its own sword accessory. But that’s not all. Flash and Ming come in unique full-color packaging that comes with a fold out diorama of Hawk City. Pose your figures to recreate the popular scene from the film! Will Ming emerge victorious or will Flash save the day once again? It’s up to you but, not for long. Order your limited edition set today! Ages 14 and up.